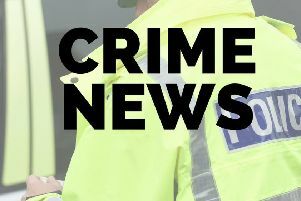 A bookmakers in Corby was robbed by a man who stole cash before making off as a pillion passenger on a motorbike. The incident took place at the Coral bookmakers in Studfall Avenue on Sunday, April 9, between 9.30am and 9.55am. Police have just released details of the robbery. A member of staff opened the fire exit and took out rubbish. A few minutes after coming back in, he noticed a man wearing a motorcycle helmet at the back of the shop. The man approached the staff member, pushed him and made several demands for money. He then removed cash from the till and left the shop, making off as a pillion passenger on a motorbike. The other person on the motorbike did not come into the store. The suspect is described as being about 5ft 10in and was wearing a black motorcycle helmet, a dark blue hooded jacket and Adidas tracksuit bottoms. Witnesses, or anyone who may have seen the motorcycle in the area around the time of the robbery, are asked to contact police on 101 or Crimestoppers on 0800 555111.